Like a lot of little girls, between the ages of about four and fourteen I was obsessed with horses and ponies. Posters lined every inch of my bedroom wall (and the bathroom next door), I had a small, but treasured collection of Julip horses (complete with their own stable and jumps) and every year when my birthday came round I’d hope against hope that I’d open up the curtains to find a pony tethered to the gate-post outside (this never, sadly, never happened). Quite aside from the financial implications of owning a pony, growing up in London presented a pretty major obstacle to my childhood dream. But while my parents never bought me a four-legged friend, I did eventually manage to convince them to take us on a family riding holiday in Ireland. Staying in the lodge of an ancient country estate, we spent a full five days careering round the Irish countryside come wind, rain or shine (ok, pretty much only the former two, it being Ireland), covering everything in mud and tiring ourselves out before returning to a hearty home-cooked meal and cosy evenings by the fire. An army marches on its stomach and we applied much the same principle to this holiday, tucking into enormous meals as our appetites increased over the course of the week. I can’t remember a huge amount about the food (other than it being a huge amount), but one thing that did stick in my memory was the homemade soda bread. Dense and dark and slightly sweet, it arrived at breakfast, lunch and dinner sliced into thick slabs and spread with generous amounts of creamy Irish butter, the answer to appetites of any size and a flavour I’ll always associate with Ireland. Fast forward several years and I decided to make my own. Carnivorous Fiancé had asked if I could make him some soda bread and after researching several recipes, I decided to make this savoury feta and thyme version. I wanted something slightly lighter and brighter than that original Irish loaf so haven’t included black treacle here, but this recipe is infinitely adaptable – add treacle or molasses for a rich, dark sweetness, stir in raisins, nuts or seeds, add another sort of cheese or vary your flour and liquid base. Soda bread is traditionally made with buttermilk, but having been reliably assured by Hugh Fearnley-Whittingstall (by way of the Channel Four website, not personally) that I could substitute the natural Greek yoghurt I had to hand, I added it to the mix and twenty minutes later a perfect loaf of bread emerged from the oven. Five ingredients, less than five minutes mixing and another twenty in the oven and this loaf is yours. It’s not quite what you’d call a fifteen minute meal (although give me a pat of butter and I’d be more than happy to make it one) but it’s an easy recipe and perfect if you’ve never made bread before as it doesn’t involve any kneading. Eat this bread fresh from the oven as it is. Denser than a normal loaf it also makes amazing toast, drizzled with olive oil or smeared with butter. And if you want the perfect base for scrambled eggs and smoked salmon, look no further. But my top tip? Drizzle a little honey over a slice – it works wonders with the herby notes and salty feta and is probably one of the best things I’ve eaten all week. Preheat the oven to 230 degrees C and place a baking stone or tray in to heat up. In a large bowl, mix together all the dry ingredients. Add the yoghurt and using a dough scraper (if you don’t have one, your hands will do), mix together for about two minutes until just combined. Flour your hands and the work surface, tip out your sticky dough and shape it into a round. Place directly onto your baking stone (or tray) and cut a deep cross in the top of the dough. Bake for 15 – 20 minutes or until the crust is golden and the bottom sounds hollow when you tap it on the bottom. Leave to cool on a wire rack before slicing and eating. This loaf is particularly delicious toasted. The feta and thyme also taste wonderful if you add a slick of golden honey: the perfect combination of herby, salty and sweet. I’ve never thought of putting cheese in soda bread – I wasn’t really sure it would work. Now that you’ve reassured me it does, I can’t wait to experiment! I make plain soda bread all the time for breakfast – so wonderful fresh from the oven and slathered in jam. This sounds delicious… I’m on board with anything that involves feta 🙂 And I love how simple and fast this recipe is. Three of my favourite things: soda bread, feta, thyme. I would go make this right now if there were any fresh thyme in the house (we always have feta). Love the idea of drizzling with honey. 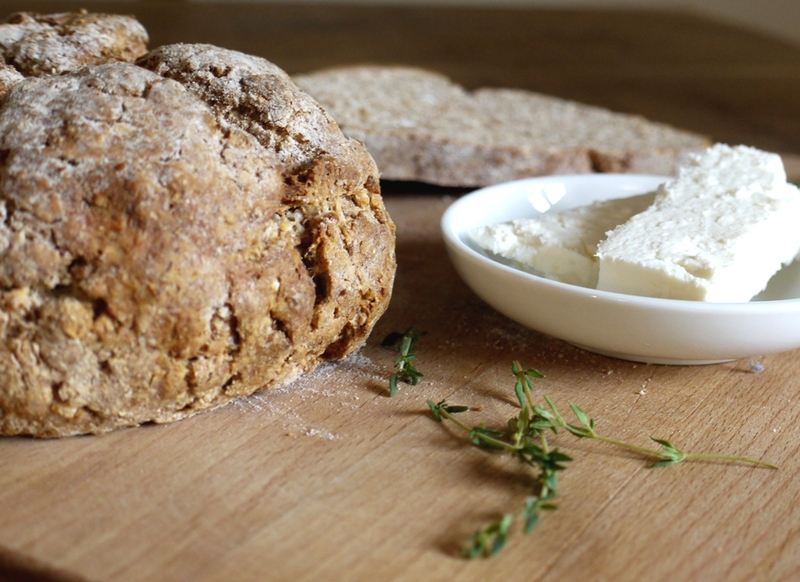 I was thinking just last night about making some soda bread this weekend and this combination of feta and thyme in there sounds just perfect. Love the photos in this post too! Yes, Loaf! That sounds absolutely delicious – I love the flavour of thyme in bread since it so aromatic that it gets into every single nook and cranny! Delicious! Thank you for this post!! I honestly have no idea why I only make soda bread one month out of the year, around st patricks day. It is so good, and so insanely easy… this version looks especially good. Now I need to make it! This looks deliciously simple and I love the idea of honey drizzled on it, the sweet, salty, savoury combination. Keep meaning to try soda bread in the oven of our woodburner, hoping it will be quite a forgiving/not too precise sort of loaf. Thanks for reminding me! Elly – it’s delicious. My only complaint is that I didn’t put quite enough in, so upped the quantity in the recipe below. Connie – it’s so simple and pretty much all store cupboard staples. 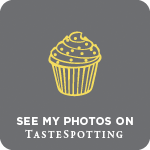 Kathyrn – thank you – I had to snap them quickly as we were both ravenous! Frugal Feeding – it’s a really lovely combo, will definitely be making again. Amy – I have no idea why I don’t make it more often, it’s so good. Andrea – I’m SO jealous of your wood burning stove – one day when we have a big house, I’ve promised myself we’ll get one. Bookmarked. This combination sounds lovely. Thanks! I never had a pony obsession hmm, and I have never ridden a horse much as I would love to. I have, elephants though. Two great things in one post – the bread sounds fantastic, I love soda bread but have never tried making it with feta. And I’m now reassured that my pony-mad 12 year old might just grow out of the obsession in a couple of years – thank you! Delicious! That would be great for a late Sunday breakfast. I love this! Going to try it out soon. Growing up in Ireland, i ate this kind of bread daily so i have to make this to remind me of home! Sarah – haha, yes, I can pretty much promise she will! Stephanie – exactly, you can make it the morning you want to eat it and it’s so fresh and delicious. Dervla – this definitely isn’t a really traditional soda bread but it’s fantastic and well worth trying. This looks wonderful! I just adore freshly baked bread, and I can tell you this wouldn’t last long in our house. I’ll have to try Hugh’s Greek yoghurt trick. this looks incredible! I am experiencing epic bread-envy right now! I really like the idea of adding feta and thyme to soda bread. A bread that I love when freshly baked (I can eat far too many slices!). 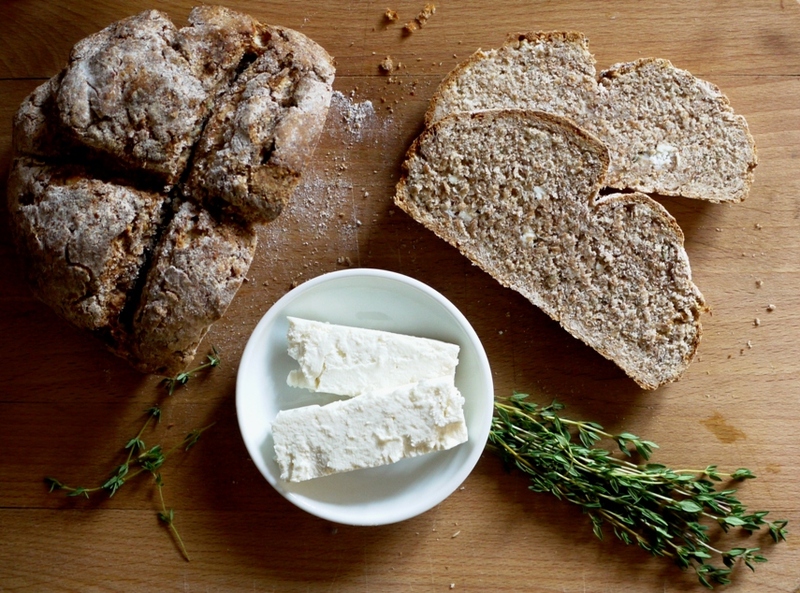 I absolutely love soda bread and really like the idea of adding feta to it. Yum. It looks amazing too. If only Hugh FW was available to call whenever we have a baking dilemma. That sounds a lovely combination and your loaf looks superb. 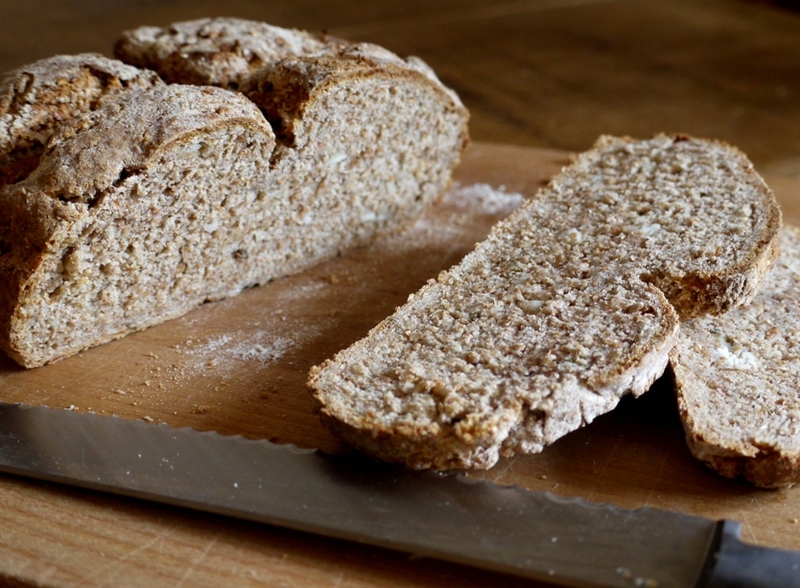 Soda bread is such an easy thing to whip up, I often make it to go with soup. If I don’t have buttermilk to hand, which is most of the time, I use yogurt too, or failing that milk with some lemon juice. I have never had the real thing though – Ireland is one of the many places I’d like to go to but haven’t yet managed. Karen – it’s amazing as toast too, definitely worth a try. Jaime – good luck and yes, please do let me know how it goes! Jennifer – the greek yoghurt seems to create a lovely texture and you can’t taste any tanginess which I thought you might be able to. Choclette – the stuff we had in Ireland was incredibly dense and dark. I prefer this as an everyday version but would love to make some soda bread with black treacle soon. 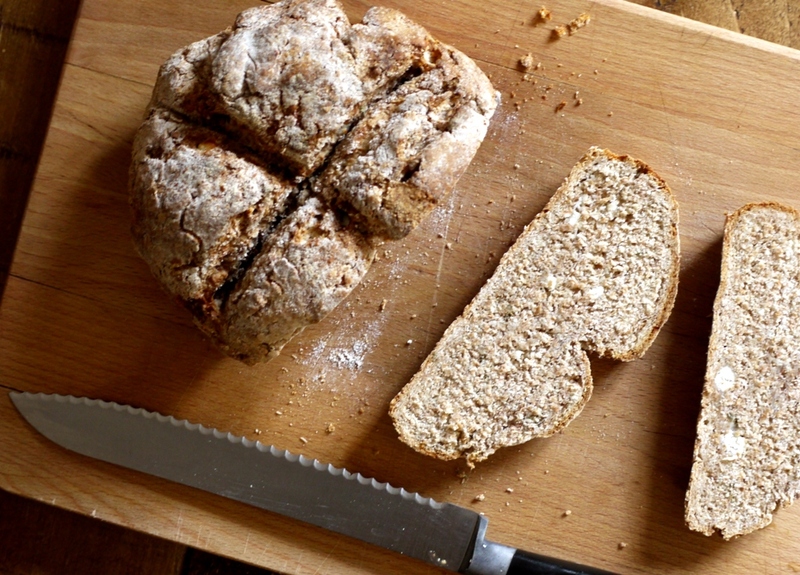 this soda bread looks amazing! I’ve had a few goes at it but it never looks as good as yours! I love the addition of herbs and cheese too! I can´t begin to tell you how excited I am about this recipe. Soda bread is nothing short of a bread miracle and the idea of feta and thyme with whole wheat flour is my kind of bread. I´m pinning and making this asap! Jenny – the herbs and cheese are such a good idea, highly recommend trying! Narf – do give this recipe a go, although it’s not a traditional Irish recipe. 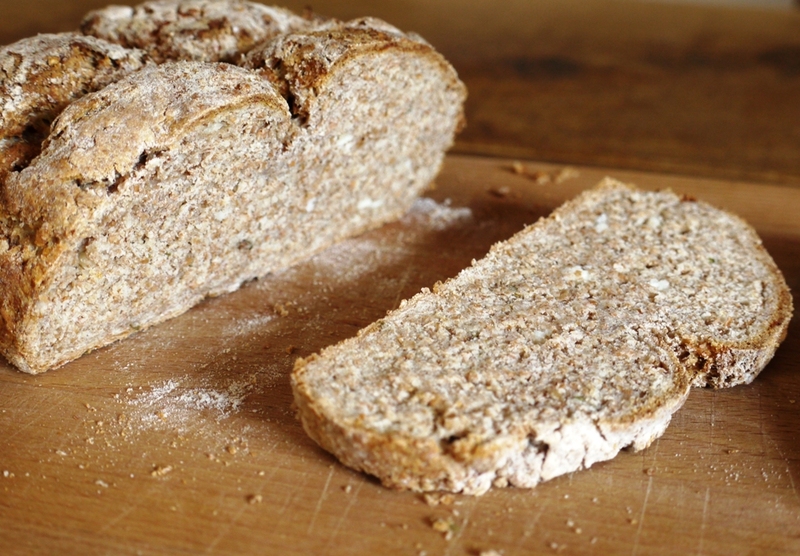 Paula – it’s such a healthy loaf and so quick to make – it can do no wrong in my eyes! This might be a silly question, but what is wholemeal bread flour? Is that whole wheat flour? Or do I go to the store and purchase “bread flour”? Wholemeal flour uses the whole grain and bread flour has more gluten than normal cake or ‘plain’ flour. If you look on the packet, it should specifically say ‘bread flour’. Hope that helps! I totally made this this week! A-MAZING! It’s all that thyme; wonderful! But, I had a baking timing problem. It was doughy and unbaked in the middle after 20 mins., so I baked it for 15 more…. oh well… nothing stopping me from excellent soda bread 🙂 I made it with baking soda and I didn’t reduce the amount of 2 tsp, I didn’t care if it grew more or whatever could’ve happened…. but nothing really exploding did LOL Go-to soda bread. For sure. Thank you! Gorgeous little recipe! I made my own version, which can be found on my blog. I naturally accredited your idea of course!